Physical activity (PA) is defined as any bodily movement produced by skeletal muscles which results in energy expenditure. Physical activity in daily life can be categorised into occupational, sports, conditioning, household, or other activities. Exercise is a subset of physical activity that is planned, structured, and repetitive and has as a final or an intermediate objective the improvement or maintenance of physical fitness. Increased PA is associated with enhanced psychological functioning and quality of life, improved cardiorespiratory ﬁtness, and decreased morbidity. Physical training programs in asthma have been designed to enhance aerobic power, neuromuscular coordination, and self-confidence.Reduced activity levels observed in asthmatics may also increase the incidence of obesity, with negative consequences on self-esteem . PA has been shown to be the strongest predictor of all-cause mortality in COPD patients, with PA showed the best discriminative properties for 4-year survival. The authors of a large study concluded: "We found that objectively measured physical activity is the strongest predictor of all-cause mortality in patients with COPD". Despite all the positive effects of PA for people with respiratory conditions, there is no evidence of change in lung function. A pilot 6 week excises intervention study measured exercise intensity, attendance rate, recorded respiratory fitness and health related quality of life (HRQoL) pre and post intervention. Asthmatic children, even with moderate to severe disease, had their aerobic capacity significantly improved after a 16-wk physical training program. There are many barriers that could limit the participation of a chronic respiratory condition patient in exercises. Children and adolescents with asthma may experience frustration, embarrassment and low self conﬁdence because of their disease-related limitations. They may also withdraw from PA because of their parents’ fear and protectiveness. The fear of breathlessness (Dyspnoea) due to cardiovascular disease, peripheral vascular disease, lung cancer, diabetes, dyslipidemia, hypertension, osteoporosis, and psychological disorders inhibits many patients from taking part in PA. Corticosteroid use, overuse of bronchodilators, and interactions with other medications can further complicate management of PA programs in these patients. Other concerns during both rest and exercise include pulmonary hypertension, gas-trapping, dynamic hyperinflation, poor gas exchange, and increased respiratory pressure associated with destruction of lung parenchyma and increased airway resistance. To facilitate engagement in exercise programs many approaches should be addressed, such as managing acute dyspnoea, Psychosocial and behavioural interventions through educational sessions focusing on specific problems such as stress management, instructions in relaxation exercises, panic control, and smoking cessation. Nutritional interventions should be considered, as well as social support, the option to participate in group activities, and the availability of professional support are frequently reported as enablers of physical activity. Individualised exercise training prescriptions should be based on patient characteristics, such as baseline pulmonary function, exercise capacity, habitual physical activity levels, inflammation and infection status to establish favourable exercise-training induced effects. In patients with advanced COPD, interval exercise consisting of repeated bouts (30–60 s) of high- or even maximal-intensity work (80–100% peak) separated by periods (30–60 s) of lower intensity work intervals, has been shown to be associated with a small increase in arterial lactate concentration, lower ventilation and degrees of dynamic hyperinflation and lower symptoms of dyspnoea and leg discomfort, thus allowing the total amount of work performed to be significantly greater than that of constant-load exercise. A large body of evidence demonstrates important health benefits from aerobic exercise, including decreases in dynamic hyperinflation and exertional dyspnea; improved exercise tolerance; and enhanced quality of life, with fewer disease exacerbations and reported sick days. To optimise the benefits gleaned from a strength training program, the exercise prescription variables of intensity, volume and frequency should be tailored to the needs of each patient. strength training exercises be performed at an intensity of approximately 60% of the muscle’s maximum force generating capacity to increase strength. To determine the amount of weight of the appropriate stimulus, the common approach is based on a 1 repetition maximum, (1-RM) or the ability to lift or perform a movement only once before fatigue prevents a subsequent contraction. If the weight employed is below 60% of the 1-RM, there may be only modest improvements of 5% to 10% in strength. The volume of the strength training exercise is a function of the number of repetitions and sets of an exercise completed. For frail patients, the ACSM recommends that at least one set of each exercise be performed. As patients increase the intensity of their exercise prescription, the number of sets of an exercise may also increase. Once the patient can complete the pre-determined number of repetitions for all the prescribed sets, the resistance should be increased. Specific exercises should target strength improvements for the major muscle groups which include the chest, shoulders, arms, upper and lower back, abdomen, hips and legs. One or more exercises can be prescribed for each of these muscle groups depending upon the patient’s specific needs. The final component of the exercise prescription that needs to be considered is frequency or the number of times the exercise should be performed per week. Outpatient recommendations stipulate that individuals exercise 2 to 3 times per week and to allow 48 hours of recovery between exercise bouts. Exercises should be discouraged during periods of active infection in patients with Cystic Fibrosis. The Motivate2Move website, created by Wales Deanery, has a useful section on physical activity and respiratory disease. ↑ Diseases, C. R. (n.d.). CHRONIC RESPIRATORY, 12–36. ↑ Caspersen CJ, Powell KE, Christenson GM. Physical activity, exercise, and physical fitness: definitions and distinctions for health-related research. Public Health Rep 1985; 100: 126–131. ↑ 3.0 3.1 Berntsen S, Carlsen KC, Anderssen SA, et al. Norwegian adolescents with asthma are physical active and fit. Allergy 2009;64:421–6. ↑ NEDER, J. A., L. E. NERY, A. C. SILVA, A. L. B. CABRAL, and A. L. G. FERNANDES. Short term effects of aerobic training in the clinical management of moderate to severe asthma in children. Thorax 54:202–206, 1999. ↑ ORESTEIN, D. M. Asthma and sports. In: The Child and The Adolescent Athlete, O. Bar-Or (Ed.). London, UK: Blackwell, 1996, pp. 433–454. ↑ GIBSON, P. G., G. V. HENRY, and J. H. VIMPANI. 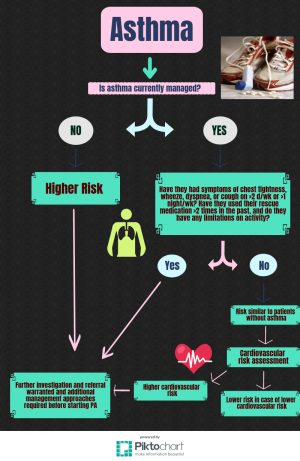 Asthma knowledge, attitudes, and quality of life in adolescents. Arch. Dis. Child 73: 321–326, 1995. ↑ NIXON, P. A. Role of exercise in the evaluation and management of pulmonary disease in children and youth. Med. Sci. Sports Exerc. 28:414–420, 1996. ↑ Schols AM, Ferreira IM, Franssen FM, et al. Nutritional assessment and therapy in COPD: a European Respiratory Society statement. Eur Respir J 2014; 44: 1504–1520. ↑ Hill, N.S. (2006). Proceedings of the American Thoracic Society. Pulmonary Rehabilitation; 3:66-74. ↑ Stewart M, Masuda JR, Letourneau N, et al. 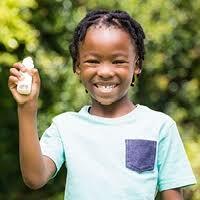 “I want to meet other kids like me”: Support needs of children with asthma and allergies. Issues Compr Pediatr Nurs 2011;34:62–78. ↑ Williams B, Hoskins G, Pow J, et al. Low exercise among children with asthma: a culture of over protection? A qualitative study of experiences and beliefs. Br J Gen Pract 2010;60:319–26. ↑ . Briggs DD Jr. Chronic obstructive pulmonary disease overview: prevalence, pathogenesis, and treatment. J Manag Care Pharm 2004;10(4 Suppl):S3-10. ↑ CROFT, D., and B. LLOYD. Asthma spoils sport for too many children. Practitioner 233:969–971, 1989. ↑ Chatila WM, Thomashow BM, Minai OA, Criner GJ, Make BJ. Comorbidities in chronic obstructive pulmonary disease. Proc Am Thorac Soc 2008;5(4):549-55. ↑ Hill K, Vogiatzis I, Burtin C. The importance of components of pulmonary rehabilitation, other than exercise training, in COPD. Eur Respir Rev 2013; 22: 405–413. ↑ Spruit MA, Singh SJ, Garvey C, et al. 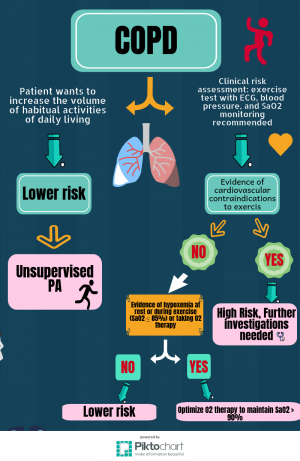 An official American Thoracic Society/European Respiratory Society statement: key concepts and advances in pulmonary rehabilitation. Am J Respir Crit Care Med 2013; 188: e13–e64. ↑ . Schols AM, Ferreira IM, Franssen FM, et al. Nutritional assessment and therapy in COPD: a European Respiratory Society statement. Eur Respir J 2014; 44: 1504–1520. ↑ 28.0 28.1 Most, D. (n.d.). COPD and exercise : does it make a difference ?, 12(2), 38–49. ↑ Vogiatzis I, Nanas S, Kastanakis E, et al. Dynamic hyperinflation and tolerance to interval exercise in patients with advanced COPD. Eur Respir J 2004; 24: 385–390. ↑ 32.0 32.1 32.2 32.3 32.4 32.5 Burr, J. F., Davidson, W., Shephard, R. J., & Eves, N. (2012). Assessing risks for physical activity clearance and prescription, 58, 761–764.